Naissance is backing the Soil Association’s Campaign for Clarity to promote #OrganicBeauty products and raise awareness of the benefits of going organic. This will run during September when we will offer discounts on selected organic oils. 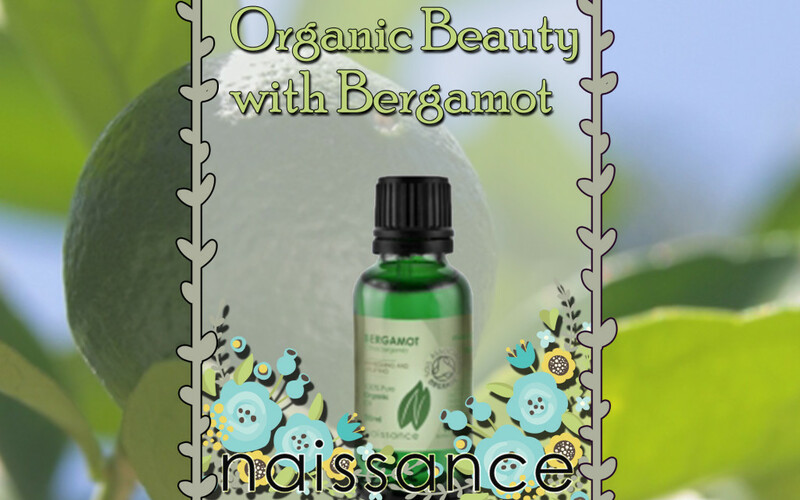 Bergamot is one of our well-loved citrus essential oils; it comes up time and time again as the trusty favourite of our wonderful staff and customers, and it has been used within the beauty industry for a very long time as part of botanical beauty recipes for products such as facial creams, lotions and balms alike. This is predominantly due to its powerful anti-microbial and anti-bacterial properties that make it the perfect essential oil to aid in the healing of skin irritations like acne, boils or even infections. Bergamot oil is also helpful to tone, even and maintain the skin’s complexion thanks to its ability to balance the melanin supply. When used as part of an aromatherapy massage, the oil can help promote and maintain body beautiful skin by staving off any potential outbreaks of skin irritations or infected boils or spots. If you find that you are on a budget or don’t have the time for a massage, you can always add up to 10 drops of the oil to your bath and enjoy its aromatherapeutic benefits by unwinding and soothing away any worries from your day. A relaxing soak in the tub with this oil will help to uplift the mood and give you a positive focus as well as all the above beautiful skin benefits. The wide range of skin benefits and aromatherapy properties that Bergamot oil has to offer can also be used as part of a mild stretch mark and scar healing treatment, so we have put together a little DIY Beauty recipe using a blend of three oils that help to restore and rejuvenate the skin. This natural beauty serum will help to reduce visible scarring and stretch marks (and it will also smell positively wonderful!) and it is simple to prepare using Organic Almond oil, Organic Rosehip oil and Organic Bergamot oil. Take your empty bottle and add 20ml organic rosehip carrier oil using the pipette or the funnel. This should make it easier to get your oils into the bottle without any waste. Then add the 10ml of organic Almond carrier oil again using the pipette or the funnel. Carefully add your 10 drops of organic Bergamot essential oil. Bergamot is a photosensitive oil, which means you should not expose to direct sunlight after use. We advise you use this blend as a night time serum to avoid being exposed to the sun.